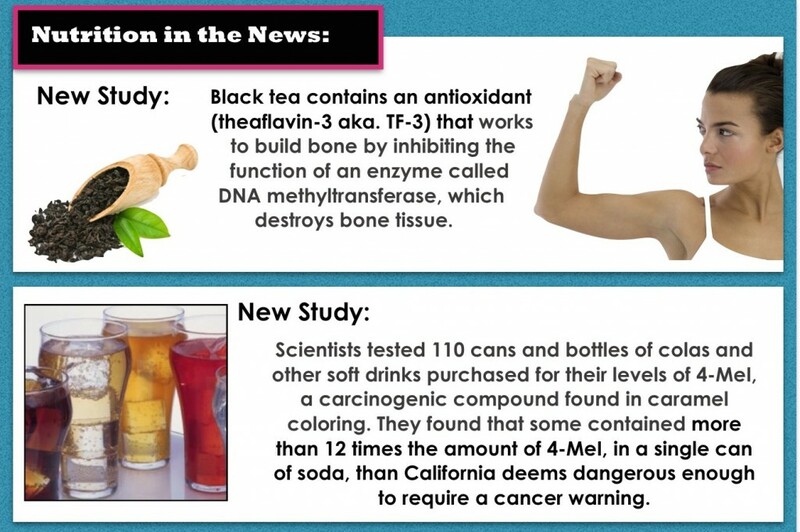 For this edition of Nutrition in the News we’d like to share two recent articles that we found interesting pertaining to popular beverages. This first one on the topic of osteoporosis is of particular interest to me (Mira). Osteoporosis can be a devastating progressive disease that is characterized by loss of bone tissue, increasing the risk of factures. Although usually associated with the elderly, bone loss that can lead to osteoporosis actually starts much earlier. As we shared with you in Naked Calories, osteoporosis was the catalyst that forced us on our personal quest to take a much deeper look at the essential micronutrients after I (Mira) was diagnosed with advanced osteoporosis at the age of thirty. Luckily we reversed my osteoporosis, but research on the topic always peaks my interest. So, what did the study say – what is the good news? In this new study, published in Nature Medicine, a group of researchers in Japan found that drinking black tea may help in the treatment of osteoporosis. It was discovered that black tea contains an antioxidant called theaflavin-3 (TF-3). This antioxidant works to build bone by inhibiting the function of an enzyme called DNA methyltransferase, which destroys bone tissue. In this study when the mice that were suffering from osteoporosis were given TF-3 they regained bone mass, which was then comparable to those of healthy mice. Now for what might be a bit of bad news. We should let you know that before you start brewing up that cup of black tea, the research indicated that, to make a noticeable difference, a 130 pound adult would have to consume 60 cups over a three day period. A three-day period where you just may be spending all of your time running to the bathroom. But hey, strong bones may be worth a few bathroom breaks. Don’t you think? This second piece of Nutrition in the News should shock you into putting down that can of soda once and for all. Now, if you’ve already read our book, Rich Food Poor Food, you have heard us warn you about the fact that caramel color is a likely carcinogen because it contains the chemical called 4-methylimidazole (4-Mel). A new study, published in PLOS ONE, backs up our claim, and shines a light on just how big of a health concern this really is. While a study conducted by the federal government in 2007 determined that 4-MeI caused cancer in mice, there is currently no federal limit set as to the level of 4-MeI that a manufacturer can use in the production of their food or drinks. The state of California however, back in 2012, always being ahead of the nutritional curve, mandated that any product that contains 29 micrograms (mcg) or more of 4-Mel per day be labeled with a cancer warning. In this new study, Consumer Reports and the Center for a Livable Future at the Johns Hopkins Bloomberg School of Public Health teamed up to see how much 4-MeI people were really consuming through soda beverages. If the state of California dictates that 29 mcg deserves a cancer warning how much do you think researchers found in 11 popular soft drinks and colas? To gather the data, scientists tested 110 cans and bottles of colas and other soft drinks purchased at locations in California and in the New York City area, for its level of 4-MeI. What they found was that the 12-ounce cans and bottles tested contained between 3.4 mcg and 352.5 mcg of 4-MeI. You read that right! As much as 352.5 mcg of potentially cancer causing 4-MeI were found in one 12-ounce drink serving. That is more than 12 times the amount of 4-MeI, in a single can of soda, than California deems dangerous enough to require a cancer warning. Interestingly it was also found that beverages purchased in California produced by the same manufacturers as the New York City product often had lower levels of 4-MeI than their New York counterparts. Just a coincidence, or are California’s 4-MeI laws making a difference? Shouldn’t the US Government follow suit in order to spare us these carcinogenic cans of cola? And soda is just the tip of the iceberg, caramel colored beverages are not the only place that 4-MeI is used. According to the Food and Drug Administration, sodas only contribute about 25 percent of the 4-MeI in the diets of people over the age of 2. 4-MeI caramel coloring can also be found in dark sauces such as barbecue or soy, soup, pancake syrup, breads, cereals, coffee creamers and other processed goods. Like we always say, READ THE LABELS, LOOK AT THE INGREDIENTS! If it says caramel color you want to steer clear of that product. There is no way of telling how much 4-MeI is in the product. This study adds to the mounting reasons that soda should be left on store shelves. Here are our top ten reasons to avoid soda.